single pocket & combined pen pocket Self fabric ties 65% polyester 35% cotton..
No pocket/self fabric ties 65% polyester 35% cotton. 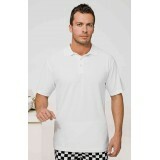 Colours Black / White ..
heavyweight pique polo shirt with 3x rust free studs. 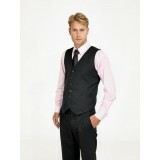 Covered seams across shoulders a..
NO pocket 35” self fabric ties 65% polyester 35% cotton. Colours Black / W..